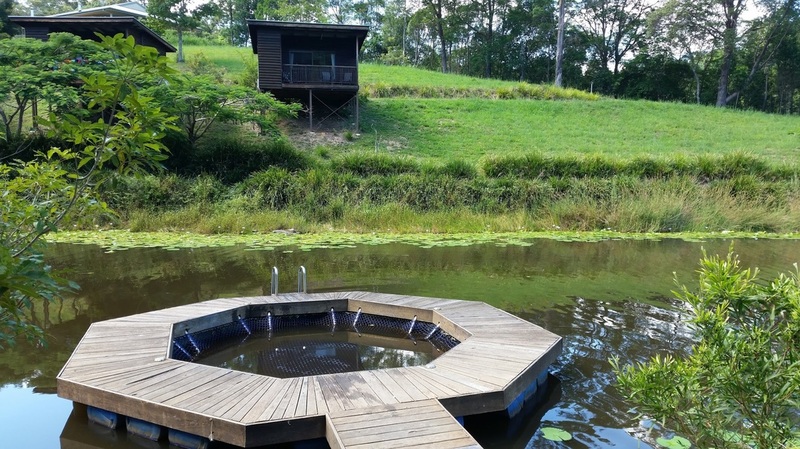 Hosanna Farmstay is a 100acre property located in Stokers Siding, which is town in the north-eastern part of NSW, in the Tweed Shire. It's around 90 minutes from Brisbane located between Burleigh Heads and Byron Bay. Hosanna has a range of accommodation options available. As we were staying for a week we decided to take an easier option and booked a powered site. However, there are alternatives of non-powered camping, permanent safari tents and luxurious cabins. There is accommodation for every style of camping. Campsites – unpowered for both tents and caravan/camper trailers. For a full explanation of accommodation options, please refer to the Hosanna website. To see a site map, please refer here. If you book into the safari tents or cabins you also have use of a huge double camp kitchen and all the cooking paraphernalia you need. This is brilliant if you don't have a lot of camping gear and don’t want to necessarily rush out and buy any. For those NOT in the safari tents or cabins - there is no camp kitchen, though you can access the hot water sinks in the main amenities block for dishwashing purpose. After signing into the office (selling a range of food essentials) we found our site down the hill and across the meandering creek. 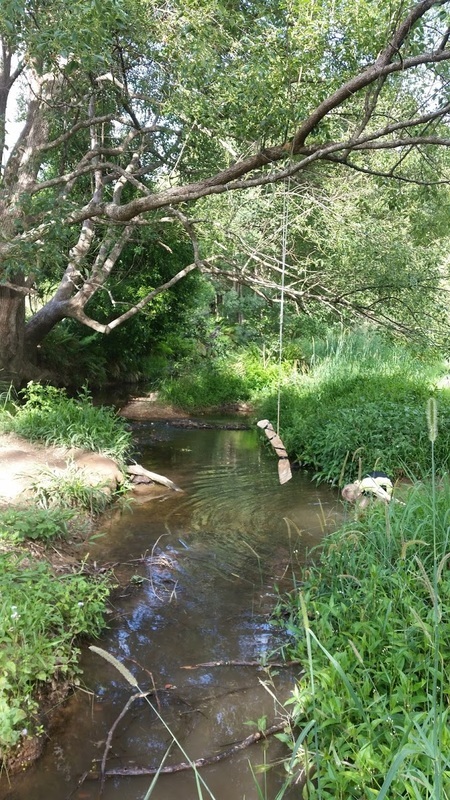 Our site was in a excellent location reasonably close to amenities, and just a above the kid friendly creek. 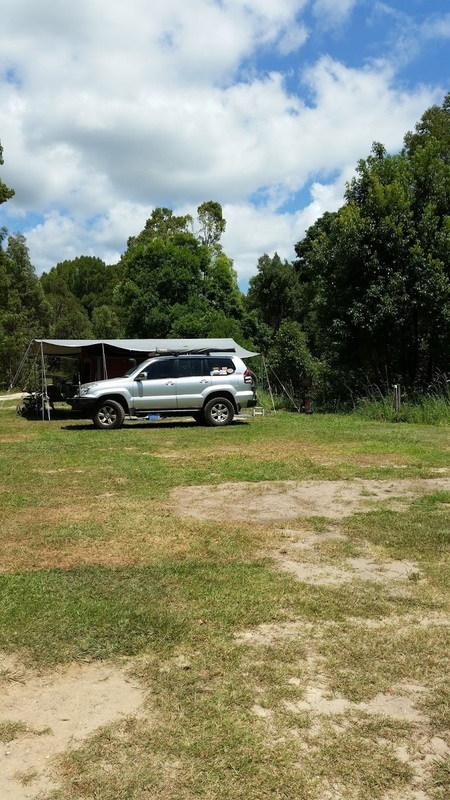 The campsites are well spaced and a good size, close enough to be social with your neighbors if you wish but nowhere near our unpleasant crowded Fingal Head experience. Soon we were set up and were cracking the first of many cold beers, the weather was brilliant, hot days but the nights cooled off just enough to be comfortable. 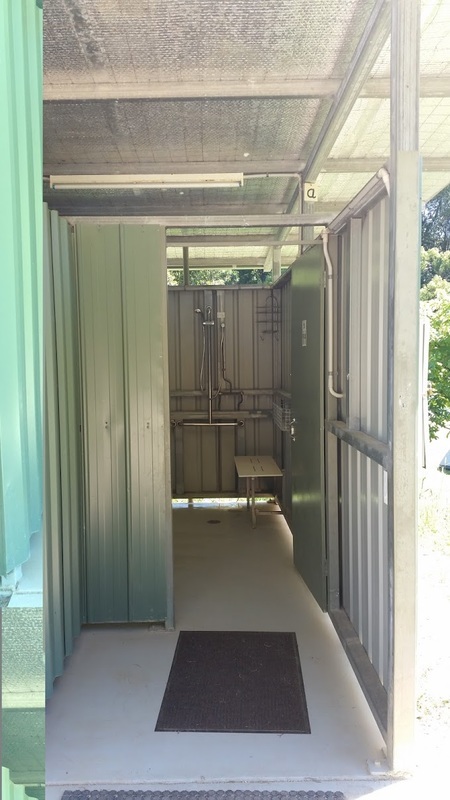 For those in caravans - there are no waste outlets, concrete slabs or water connections. 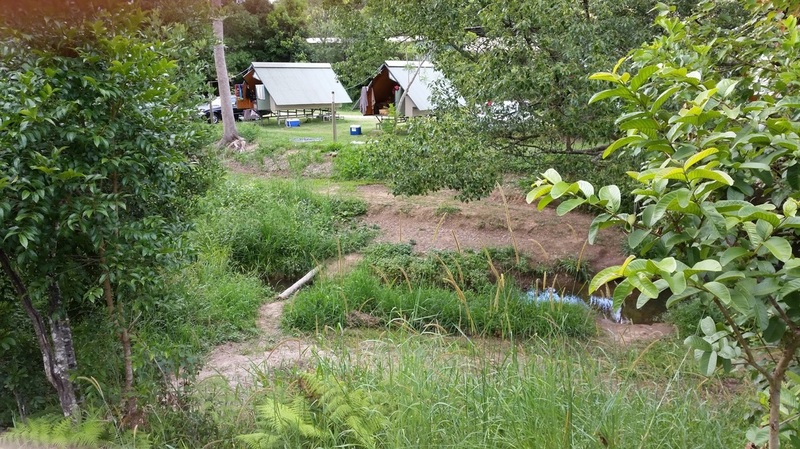 The amenities were brilliant, simply THE cleanest and best camping facilities I've ever experienced. Very clean, well stocked, including soft soap, hot showers and washing up areas outside. 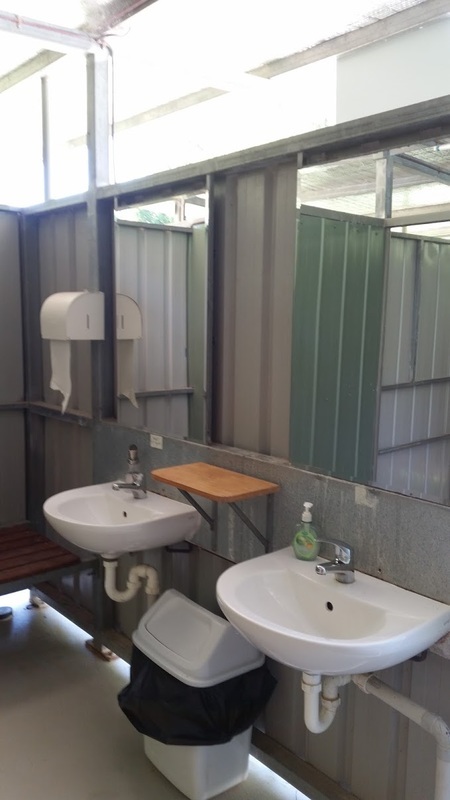 There are 4 toilets, 4 showers and also a disabled shower and toilet. To see the full range of what is on offer, ﻿﻿check out the facilities page﻿.﻿ Too much to list here! We had booked into the farm tour next morning (if coming from QLD remember to set you phone to automatic time including daylight savings mode so you're not late!). The tour is a chance to see areas of the farm outside the camping areas and is a fun and educational experience for all. Jan (pronounced Youn) was our guide for the day, he ensured that a kids and adults alike had a ball as he took us across the property, splashing through creeks as we all bounced around in the back of the 1977 land rover troop carrier. We got to feed the cows, learnt how to hypnotize chickens and many other things. At only $10 pp for a 90minutes, the tour is a lot of fun for all ages and highly recommended. The focal point of the farm is the huge dam/lake As the days were hot, we spent a fair amount of time there keeping cool. Complete with jetty, diving board, pontoon and various kayaks and inner tubes this is a great place to hang out with the other campers. There is also an undercover BBQ area nearby and wood-fired sauna, but that’s probably best for the winter. Cabins are dotted in the hill surrounding the dam if you like the idea of luxury camping. 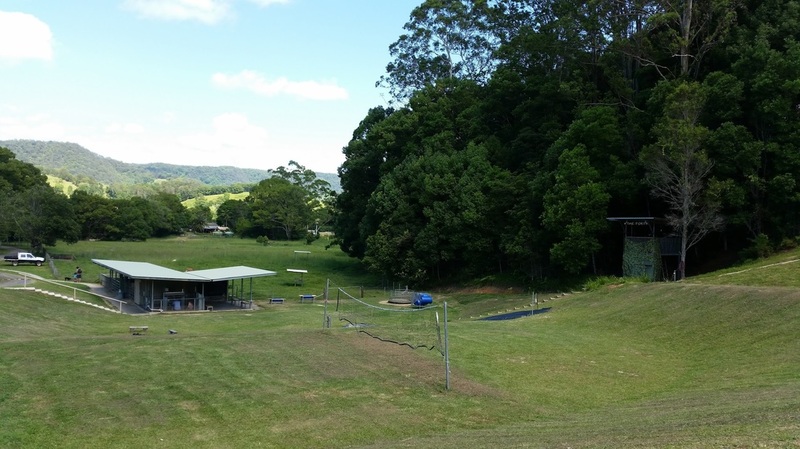 The farm boasts a playground area which has a fort and volleyball court, and in summer a bush waterslide (hay bales and plastic sheeting) is opened up each afternoon. After a liberal dosing of washing up liquid, the challenge to beat the best distance is on…. another great way to cool down. 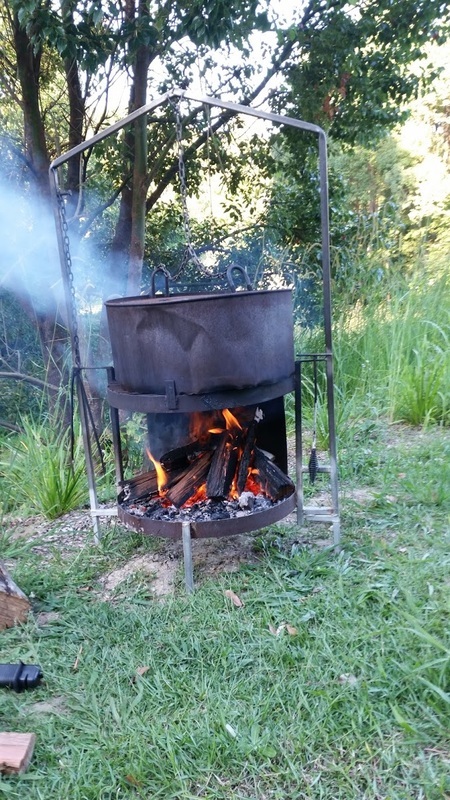 We utilized one of the farmstays “hobs”, one of their own inventions which is a portable combined fire-drum and oven. We were initially somewhat sceptical but they worked OK. Opposite the office are the animal pens where the staff conduct animal feeding each morning. 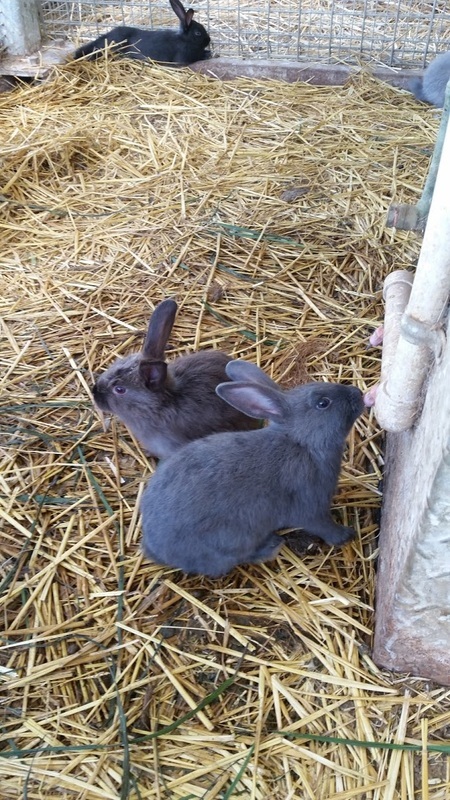 The kids can help feed the Pigs, baby calf, goats, chickens and the immensely popular rabbits. Kids can sit, hold and feed the rabbits anytime with adult supervision and let me tell you children really love the novelty of the cute baby bunnies (illegal in QLD but legal in NSW). Pretty sure they doubled their size after being fed 3 or 4 times a day. Being in the NSW hinterland There are a number of day trips and bush walks including climbing MT Warning. You are also not far from Byron Bay the most easterly point of Australia. Farmstay hobs as mentioned above, are available and located throughout the property. Firewood is available at reception or BYO wood, or find in the forest. Yes you can bring a dog but this needs to be advised at time of your booking. There is also a dog-rules form you will need to sign when checking in. Dogs are not allowed in the accommodation and must not be a problem to other guests or animals. They have a downloadable PDF with the current prices, which naturally depends on what style of camping you do. All bookings go directly to the website. Exploring the Hosanna farm stay we were very impressed with the setup. The staff are friendly and have a number of organised activities for groups and school holidays. Hosanna really caters well for kids of all ages. 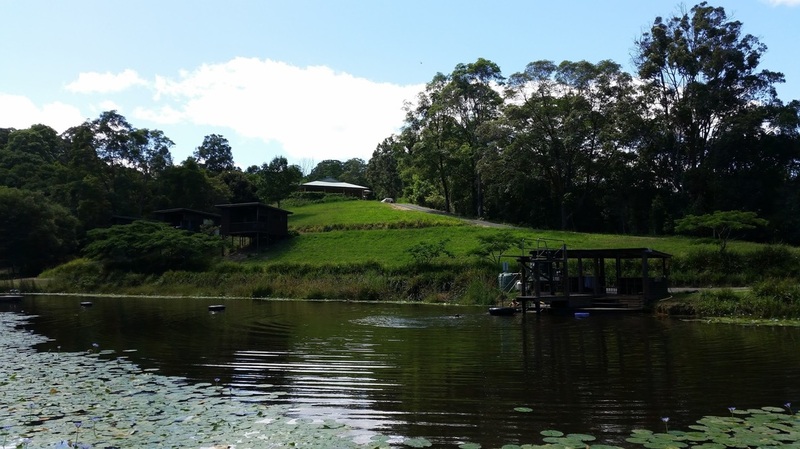 From the feeding and petting area (for the littlies,) to the kayaks and diving board for the older kids and the bush slippery slide (all ages). The sites are spacious and most are close to the creek. All photos belong to M.Wilton. Kindly reproduced with permission.